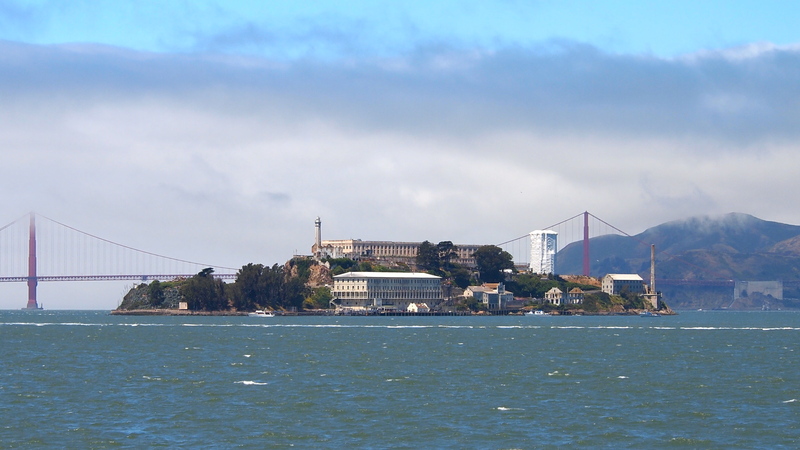 Alcatraz Island – View from the ferry. You see this quote posted in several places throughout the tour of The Rock. I don’t recall who said it, but it has an impact as you walk through the 22-acre island. The island was first used as a U.S. Military Base in the 1800s. It wasn’t until 1934 that the island began operating as a federal penitentiary. 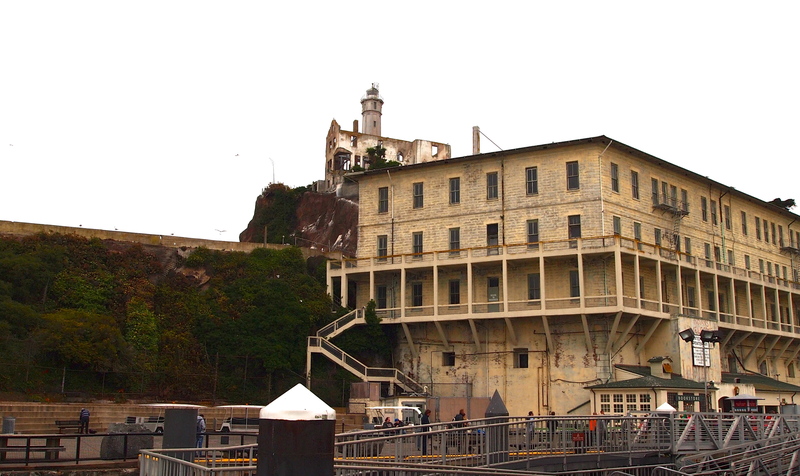 Building 64 and the Warden’s House on Alcatraz Island – View from the docks. The first thing you see as the ferry pulls into the dock is Building 64, and then the ruins of the Warden’s House up above. Building 64 was originally constructed for military officers and their families, and was later used to accommodate the families of the guards working at the prison. Many of the buildings, including Building 64, fell into disrepair over the years. When you visit the island now, many of the buildings are in ruin, or have been destroyed. However, the Cellhouse has remained in decent condition. The tour is self-guided, and includes the use of audio headsets. You can walk through the island at your own pace, taking in the history and scenery. 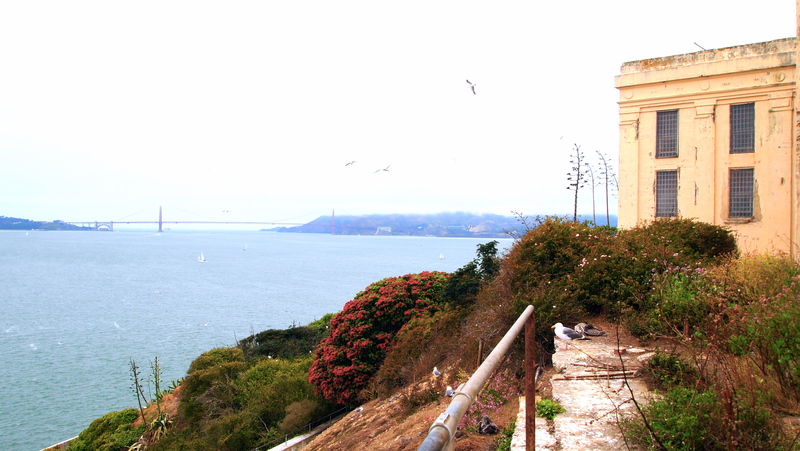 Here is the view from the Cellhouse of San Francisco Bay and the Golden Gate Bridge. Alcatraz operated as a federal prison from 1934 to 1963. During its operation, Alcatraz had 36 prisoners who attempted to escape. All but 5 of those prisoners were recaptured/accounted for. Alcatraz had 3 cellblocks, B, C and D. B and C blocks were for general population, while D was for those prisoners considered unruly or more dangerous. There were 42 isolation cells on D block, along with 6 “Holes” (the deep, dark rooms for those who behaved really badly while in prison). There was no “death row” or execution facility on the island. After closing as a federal prison, Alcatraz island was later occupied by American Indians from Nov. 1969 to June 1971. The occupation was orchestrated as a protest of the lands taken from the American Indians in the past, and it was effective in shaping Indian policy moving forward. There are many other fascinating stories about the island, from the perspectives of inmates, guards and others who occupied the island. I highly recommend taking the tour. We’ve been twice now, and it’s more intriguing with each visit. Tours are available through Alcatraz Cruises. Go to http://www.alcatrazcruises.com to book your tickets. They sell out quickly though, so I would recommend booking your tickets as soon as you know your travel plans to San Francisco. We have no affiliation with Alcatraz Cruises. We have simply taken the tour, and we loved it! This entry was posted in Travel & Adventure and tagged Alcatraz, Alcatraz Cruises, Alcatraz tour, federal prison, Olympus E-PL1, Photography, San Francisco, San Francisco Bay, The Rock. Bookmark the permalink. Good job. Sounds like interesting experience. Bill and I found Alcatraz fascinating on our visit there a few years ago. It hadn’t occurred to me to return. Hmmm.